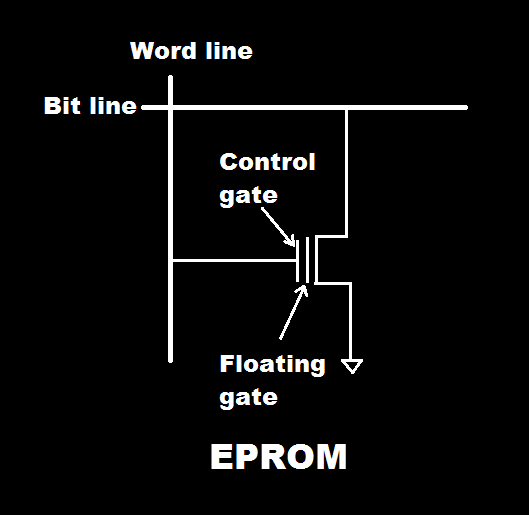 •EPROM means Erasable Programmable Read Only Memory. •It allows to store data and to erased data and add new data means it is erasable and reprogrammable ROM (Read Only Memory). •It is useful for changing or updating memory. •Ultraviolet (UV) light is use for erasing data from EPROM therefore these chips are mounted on package which have transparent window. •It is exposed to Ultraviolet (UV) light for about 20 minutes and quartz window is use. •EPROM is programmed by forcing small electrical charge on a floating gate. •EPROM consists of thousands of storage cells. •Programming phenomenon is called hot electrons injection. •Floating gate is made from polysilicon material and it is located in memory cell. •When EPROM exposed to UV light it erased all data from chip means selective data erasing is not possible with EPROM. •It is same like ROM but it consists of special transistor connected through ground. •Special transistor is act as switch and it is normally turned off. EPROM stands for Erasable Programmable ROM.Data is stored in EPROM memory cell as an electrostatic charge on highly insulated conductor. The charge can remain for many years. The figure shows EPROM memory cell consisting of a single NMOS filed effect transistor. Sketch internal design of 4x3 ROM. Justify the statement. IGBT uses a vertically oriented structure.